Just over 12 months ago La U travelled to Brazil to put in arguably their most devastating performance under Jorge Sampaoli as they obliterated a Flamengo team including Ronaldinho 4-0; prompting headlines in Brazil comparing Los Azules to Barcelona. On Wednesday night La U were back in Brazil in the quarter-finals of the Copa Sudamericana and in act of symmetry, if that’s the correct word, La U were handed their worst night since Sampaoli took over – if not their worst then certainly their most embarrassing. From start to finish São Paulo, ruthless and efficient, stormed through La U to devastating effect; Jadson opening and then closing the scoring (there’s that symmetry again) as the Brazilians stuck five past Jhonny Herrera. La U knew they had to win and Sampaoli set out his team to do just that. And then apologised after for doing so, solely taking the blame. São Paulo’s pace and precision on the counter-attack was out of this world. Lucas, who moves to France in the new year, scored and put on a show as if to say I’m worth (the reported) £35m, while Luis Fabiano netted the goal of the game, reminiscent to the one Hernan Crespo scored against Liverpool in that Champions League final. Even centre-back Rafael Toloi got in on the act, thundering in a free-kick from 30 yards. 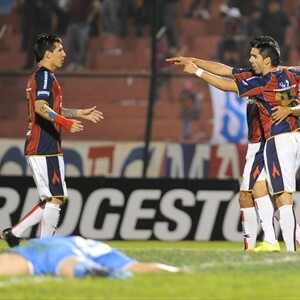 Santiago is the only city in South America with two representatives in the quarter-finals of the Copa Sudamericana after Universidad Católica and Universidad de Chile both came through tight two-legged affairs. Both teams’ progression means that there is still the possibility of the clubs meeting in the semi-final. But before then they need to come through tough ties against illustrious clubs from Argentina and Brazil. 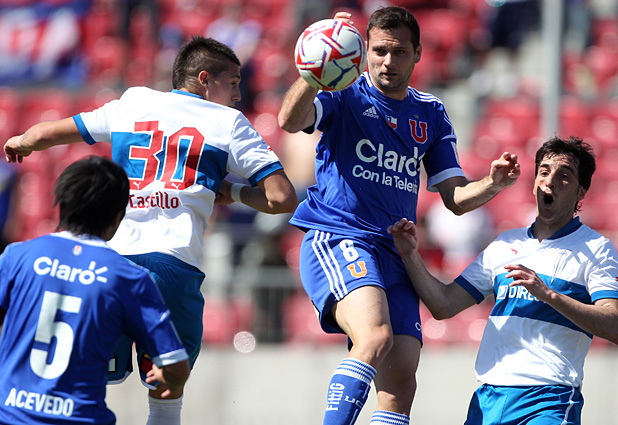 UC and La U went into their games on the back of disappointments in the league; UC were beaten 2-0 at home to Huachipato while Los Azules lost el superclásico to arch-rivals Colo Colo. Without trying to upset fans of other teams there was only one game that stood out this weekend in the Clausura: El Superclásico. Colo Colo v Universidad de Chile. The previous three games had finished with an aggregate of 9-2 in La U’s favour but as Colo Colo’s Felipe Flores point out their rivals have regressed since winning the Copa Sudamericana and reaching the Copa Libertadores semi-finals whilst Los Albos have improved immeasurably under Omar Labruna; unbeaten in 10 leagues games going into the game. There was also the small matter of Universidad de Chile’s wretched record at the Estadio Monumental having not won in over 11 years. In terms of quality it shaped up to be the tightest match between the two sides in 18 months or so. What transpired didn’t surprise many with incidents, controversies, red cards, missed chances but not as many goals as one would come to have expected. And La U still can’t win in Macul . . . While the Copa Sudamericana began back in late August Universidad de Chile had to wait until Tuesday evening (CLST) before they could begin the defence of the title they won in thrilling fashion last year. In that time three Chilean sides – Cobreloa, Deportes Iquique and O’Higgins – fell by the way side which left Universidad Católica as the sole Chilean survivor of the first two rounds (La U entering at the last-16 stage as holders). Universidad de Chile had not won on the continental or international stage since their obliteration of Deportivo Quito at the quarter-final stage of the Copa Libertadores in May. Since that 6-0 thrashing of the Ecuadorians La U have played 7 games, drawn 4 and lost 3 – one of which was on penalties. And it was Ecuadorian opposition again for Los Azules in the shape of Emelec from the city of Guayaquil. But if you were looking for symmetry as La U ended their winless run then you will be disappointed. La U lacked the fluidity, tempo and aggression that brought them success in last year’s edition of the Copa Sudamericana, falling behind to a fine Luciano Figueroa finish before Enzo Gutiérrez equalised. Marlon de Jesús put Emelec back in front as the game headed for the recess but Sebastián Ubilla restored parity moments after the break. La U could not kick on and find the winner which would have given them a slender advantage going into the return leg. Santos lifted the Recopa Sudamericana for the first time in their history after a 2-0 aggregate win over Copa Sudamericana holders Universidad de Chile. The first-leg in a wet Santiago finished 0-0 but the quality and pace of the Brazilians on the break proved too much for La U in what was an entertaining and fast-paced encounter. 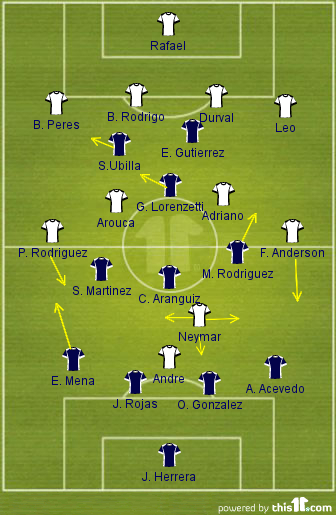 Santos were sent out in a more functional 4-4-2 by coach Muricy Ramalho; Neymar given freedom to roam around Andre with Felipe Anderson and Patricio Rodriguez on the wings and Arouca and Adriano the holding pair in midfield. 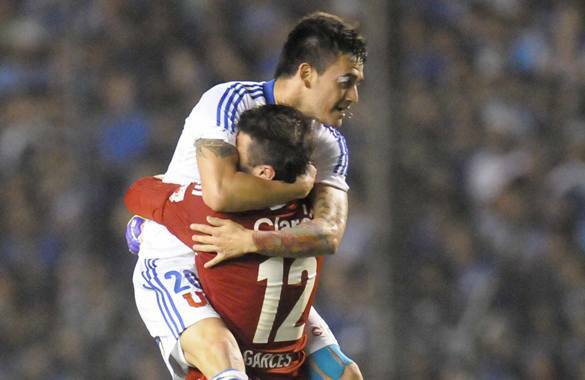 It was a busy evening for Chilean clubs spread across three competitions last night. 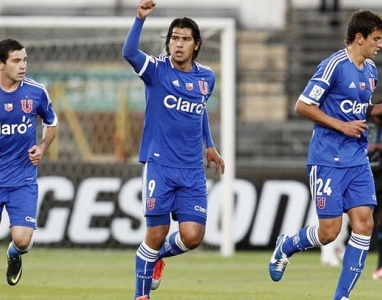 Universidad de Chile returned to domestic business, the Copa Chile group stage got under way with eight matches and O’Higgins went to Paraguay looking for progression to the second round of the Copa Sudamericana. It turned into an interesting evening with La U and Palestino sharing five goals, four Primera División teams losing to lower league opposition and O’Higgins well beaten.